Enhanced Mid-Range PIC® MCUs can contain up to 4096 bytes of addressable data memory. 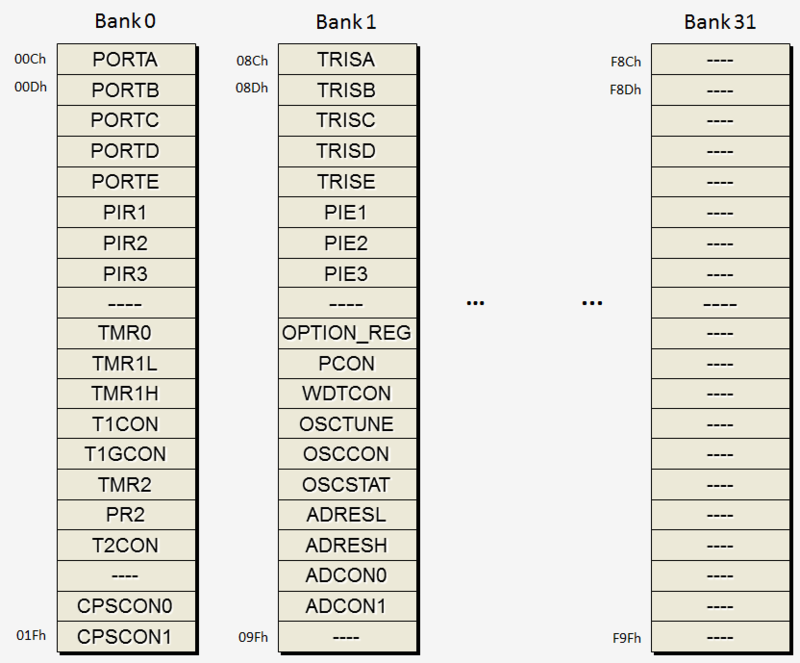 Data memory is partitioned in up to 32 memory banks with 128 bytes in each bank. 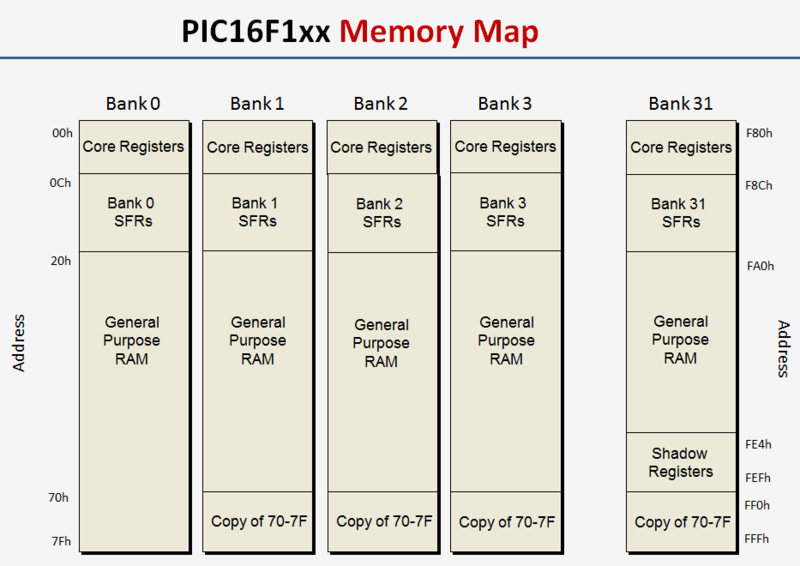 The first 12 entries of each PIC16F1xxx data memory bank contain registers referred to as the core registers. These 12 registers are repeated on each bank. The core registers can be accessed from any active bank. Referred to as the Working Register or W register, WREG serves as an accumulator. INTCON is the control register for the PIC16F1xxx interrupts. 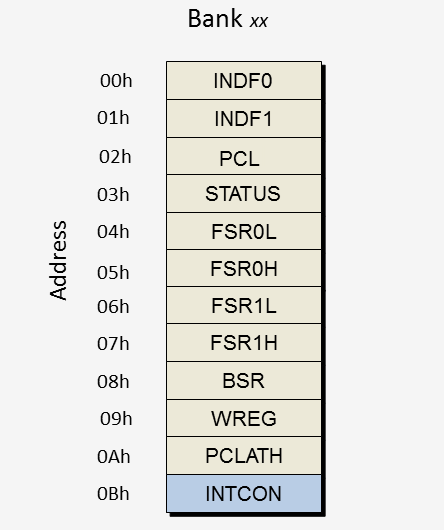 Information on using this control register can be found in the Interrupt section of the PIC16F1xxx tutorial. 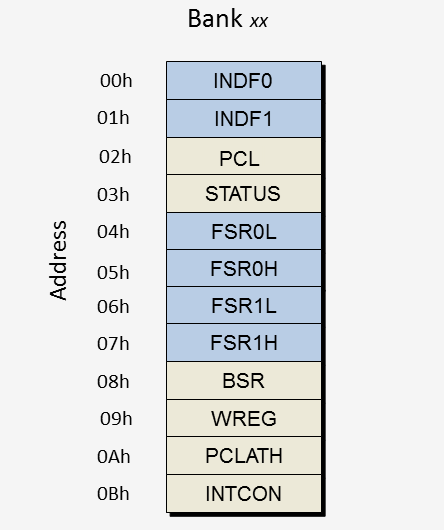 In each of the PIC16F1xxx's data banks there are up to 20 Special Function Registers (SFRs). The SFRs are located just below the core registers starting at address xxCh. SFRs control the PIC16F1xxx peripherals , digital I/O ports , and oscillator settings. 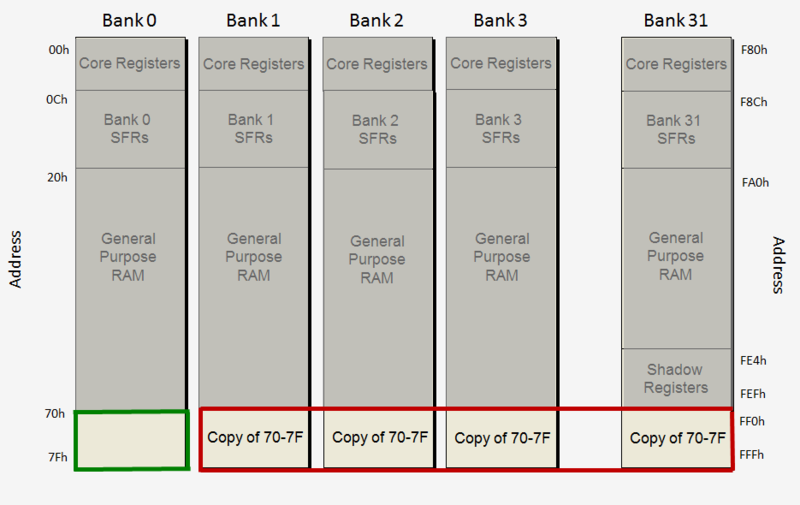 Unlike the core registers SFRs are NOT duplicated on each bank. Application programs need to ensure the appropriate bank has been selected before accessing an SFR. The SFRs for each PIC®MCU will vary. Consult the data sheet for the name and location of the SFRs for the MCU you are using. 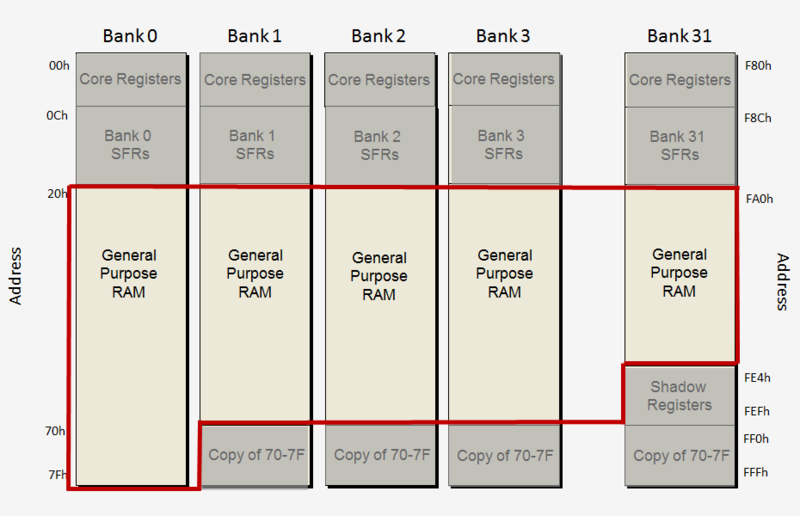 The general purpose RAM is located on each memory bank just below the SFRs. This memory is available for application data. The last 16 bytes of bank 0 (addresses 70h - 7Fh) are repeated on every data bank. This allows application programs to access variables located in these addresses without having to set BSR. Located in the bottom of bank 31 are the PIC16F1xxx shadow and stack registers. The shadow registers save the program's context by capturing several core registers when an interrupt occurs. The core registers are restored when a RETFIE (return from interrupt) instruction is executed. 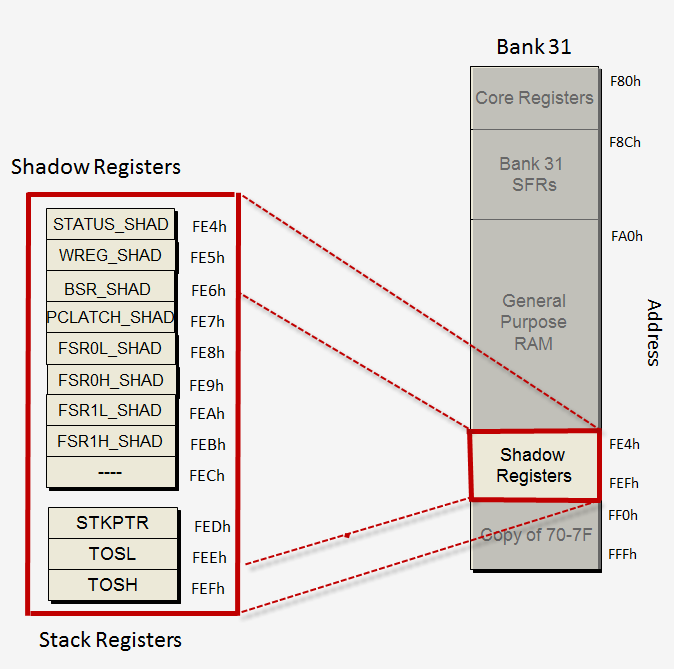 More information on the shadow registers can be found in the interrupt section of the PIC16F1xxx tutorial.